Bush: Chris [Cox, SEC Chairman], glad to see ya’, but weren’t you fired yesterday? Cox: Demagogic pols and gambling in the casino, I’m shocked I tell ya.’ To think I was once on his VP short list. Bush: Shoot John don’t mean it, he’s just desperate to say something. Always been his damn problem. Ben Bernanke [Fed Chairman]: Obama’s been quiet on all this. Bush: Daley [Chicago Mayor, kingmaker] must be outta town. Bush [glancing at transcript]: Henry [Paulson, Tresury Secretary], your a smart fella, how do you pronounce this word, liquid-nity? Paulson: Mr President, when we pitched this idea a few months ago you said to sit tight. Care to take a bow? Bush: Nah, no way this goes down without an official crisis. Paulson: What makes a crisis official? Bush [badly imitating the Platters]: Ownleee youuuu can make da dar’ness briiiidde. Paulson: I feel so used. Bush: Now you know how your clients felt. If you need to speak to someone for support, I can gitya Colin Powell’s cell. Cox: You’ll never get through, every McCain insider has him on speed dial. 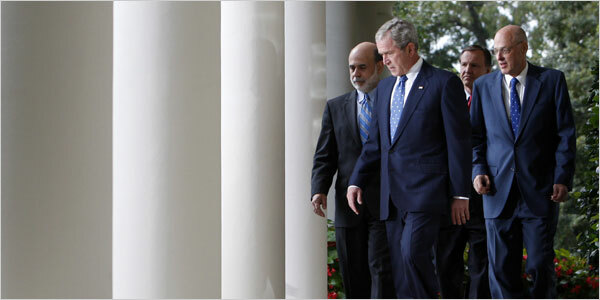 Bernanke: I hear their so desperate to get Powell, they offered Palin. Bernanke: No Baberham Lincoln herself. Cox: Wow, when they said she was a team player, they weren’t kidding. Bush [speaking into desk as if it was bugged]: Hey guys, sorry I’m late, whatcha talking about. Bush: OK tell me again, who looked most scared when you guys laid it all out on Capitol Hill yesterday. Bernanke: Well Nancy Pelosi looked like she just left her Archbishop’s office and Harry Reid just kept glaring at Barney Frank. Cox: Takes a real man to make eye contact with Frank, his aides get so jealous. Presidential aide: Sir, Scott McClellan is waiting. Bush: Running gag, means time to go. Remember gentlemen, grim’s the word. WASHINGTON — The Bush administration, moving to prevent an economic cataclysm, urged Congress on Friday to grant it far-reaching emergency powers to buy hundreds of billions of dollars in distressed mortgages despite many unknowns about how the plan would work. Henry M. Paulson Jr., the Treasury secretary, made it clear that the upfront cost of the rescue proposal could easily be $500 billion, and outside experts predicted that it could reach $1 trillion. The outlines of the plan, described in conference calls to lawmakers on Friday, include buying assets only from United States financial institutions — but not hedge funds — and hiring outside advisers who would work for the Treasury, rather than creating a separate agency. Democratic leaders immediately pledged to work closely with Mr. Paulson to pass a plan in the next week, but they also demanded that the measure include relief for deeply indebted homeowners, not just for banks and Wall Street firms. At the end of a week that will be long remembered for the wrenching changes it brought to Wall Street and Washington, Mr. Paulson and Ben S. Bernanke, the Federal Reserve chairman, told lawmakers that the financial system had come perilously close to collapse. According to notes taken by one participant in a call to House members, Mr. Paulson said that the failure to pass a broad rescue plan would lead to nothing short of disaster. Mr. Bernanke said that Wall Street had plunged into a full-scale panic, and warned lawmakers that their own constituents were in danger of losing money on holdings in ultra-conservative money market funds. People involved in the discussions on Friday said that Mr. Paulson said he did not want to create a new government agency to handle the rescue plan. Rather, he said, the Treasury Department would hire professional investment managers to oversee what could be a huge portfolio of mortgage-backed securities. He indicated that he wanted to buy securities only from United States financial institutions, a decision that could anger legions of foreign institutions that poured hundreds of billions of dollars into the American mortgage market in the housing boom, and have customers located here. Basic questions remained unanswered as of Friday evening, including how much of the mortgage market the administration hoped to buy up. The broader economic questions were even more daunting. What were the dangers in letting the government borrow another $500 billion — which ultimately might have to come from foreign investors — at the same time the deficit was already skyrocketing? Would this epic bailout lead to the same kind of runaway inflation that plagued the United States throughout the 1970s? But as the stock market zoomed for the second day in a row, mainly in response to hopes of a sweeping bailout plan from Washington, President Bush and lawmakers alike focused on how fast they could deliver as much government help as necessary. “Given the precarious state of today’s financial markets — and their vital importance to the daily lives of the American people — government intervention is not only warranted, it is essential,” President Bush said in a speech in the Rose Garden at the White House. News of the giant rescue plan sent stock markets soaring around the world. The Dow Jones industrial average shot up 368 points, or 3.35 percent, on Friday, after having jumped 410 points on Thursday on early rumors of the plan. The rally erased the losses from earlier in the week and allowed stock prices to end higher for the week. Perhaps more important to Fed and Treasury officials, the credit markets showed signs of thawing as well. Yields on three-month Treasury bills had sunk to almost zero on Wednesday and Thursday as investors fled from most debt securities and poured their money into the safest and shortest-term Treasuries. But on Friday, the yield on three-month Treasuries had edged up to 0.99 percent — still well below normal, but much closer to normal than before. Meanwhile, the Federal Reserve and Treasury deployed additional tens of billions of dollars to prevent an investor panic and flight from the nation’s money market mutual funds. Such funds, totaling $3.4 trillion in assets, are held by tens of millions of individuals and are traditionally considered as safe as bank deposits. But they had come under pressure in recent days as investors began to pull money out faster than the funds could sell assets. The Fed announced that it would lend money to money market funds to make certain they could meet all the demands of investors without having to sell off assets — including mortgage-backed securities — at fire-sale prices. The Treasury Department, in a coordinated announcement, said it would use $50 billion in the government’s Exchange Stabilization Fund, a fund normally reserved to deal with currency imbalances, to insure money market fund customers against losses. While the stock market showed its euphoria, the political obstacles to resolving the financial crisis remained high. The first is simply a matter of time: Congress is set to adjourn at the end of next week, and it is being asked to approve a plan involving more money than any single program in history. As of Friday evening, Mr. Paulson had yet to deliver a formal plan to Congress. House and Senate leaders pledged to work through the weekend, but they insisted that Mr. Paulson bring them a detailed plan rather than just an outline. An even bigger obstacle was the goal of the plan. President Bush and Mr. Paulson made it clear that their primary, and perhaps only, goal was to stabilize the financial markets by removing hundreds of billions of dollars in “illiquid assets” from the balance sheets of banks and financial institutions. But Democratic lawmakers insisted that any plan would also have to provide relief to millions of families that were poised to lose their homes to foreclosure. Representative Barney Frank, Democrat of Massachusetts and chairman of the House Financial Services Committee, said the plan would have to include requirements that the government reduce the loan amounts or improve the terms for many distressed borrowers. Democrats also plan to push to include another economic stimulus measure that could provide extra money for Medicaid, highways and public work projects. Republican leaders quickly warned Democrats against trying to use the emergency to extract other gains. “Loading it up to score political points or fit a partisan agenda will only delay the economic stability that families, seniors and small businesses deserve,” said Representative John Boehner of Ohio, the House Republican leader. In the conference calls with lawmakers, Mr. Bernanke said that the critical need was to have the government unclog the financial system by taking over unsellable assets — primarily securities tied to bad mortgages — so that financial institutions could resume normal business. Without action, Mr. Bernanke warned, the panic would quickly lead to a deep and extended recession. In a briefing to reporters on Friday morning, Mr. Paulson said administration officials would try to lift the overall mortgage market by having the Treasury Department immediately start buying mortgage-backed securities on the open market. The Treasury Department had already announced plans to buy $5 billion worth of securities issued by Fannie Mae and Freddie Mac, as part of its bailout of those two government-sponsored mortgage companies earlier this month. But Mr. Paulson plans to step up the Treasury’s buying, a move reminiscent of the Japanese government’s attempt to prop up Japan’s stock market by buying shares. In addition, Mr. Paulson said Fannie Mae and Freddie Mac would be pushed to buy more mortgages and mortgage-backed securities. Because the government has seized both companies and put them into a conservatorship, policy makers have direct control over their activities. Congressional officials said that they expected to get copies of a written proposal from the Treasury Department either late Friday or Saturday morning at a meeting on Capitol Hill between Treasury and Congressional staff members. Senator Christopher J. Dodd, Democrat of Connecticut and chairman of the banking committee, said that he was eagerly awaiting the administration’s plan. “I am anxious to see what they are going to offer and what tolerance level there is for things we feel a need to include if they don’t include it themselves,” Mr. Dodd said in an interview. Mark Landler, Carl Hulse and David M. Herszenhorn contributed reporting. This entry was posted in 2TG Favorites, Business & Economics and tagged Ben Bernanke, Chris Cox, Economics, Financial Crisis, Henry Paulson, The Platters. Bookmark the permalink.